This 5 light Island Light from the Williamsport collection by ELK will enhance your home with a perfect mix of form and function. The features include a Vintage Brass Patina finish applied by experts. This item qualifies for free shipping! Long Description Recalling An Age When Workmanship Was Paramount And Lampmakers Took Pride In Carefully Scrutinizing Every Detail, The Williamsport Collection Captures This Same Historic Charm And Timeless Elegance. 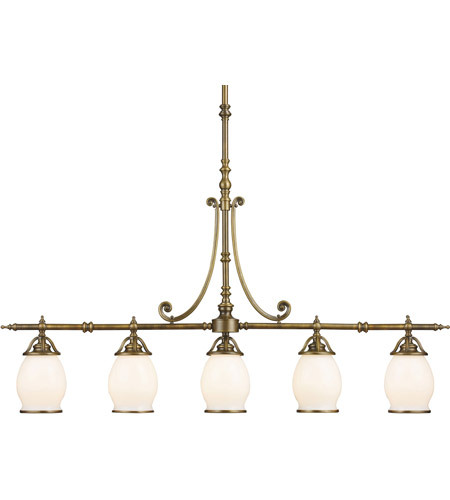 This Series Is Crafted Of Solid Brass Castings And Turnings Bathed In A Vintage Brass Patina And Topped With Blown Opal Glass Or Pleated Cream Fabric Shades With Solid Brass Framework. Each Fixture Is Supported By High Guage Decorative Tubing Reminiscent Of The Gas Lighting From The Late 1800S, Lending Themselves To Become Family Heirlooms For Future Generations.